Chicago Realtime: Court Reporters for the Chicago Legal Community for 40+ years. Chicago-area Realtime and its predecessor company have provided court reporting, legal videography, CART, and related services in the Chicago metropolitan area for more than 40 years. Chicago-area Realtime & Court Reporting has long served as a preeminent court reporting agency, leading in technical excellence, advanced technology, and client satisfaction. In January of 2015, Planet Depos a global court reporting company providing best-in-class court reporting, interpretation and trial support services, acquired Chicago-area Realtime & Court Reporting, Ltd. Planet Depos, LLC, the only international court reporting agency led by court reporters and world-renowned industry experts, provides court reporting, videography, videoconferencing, interpretation, and trial support services throughout the United States and abroad to international law firms, worldwide corporations, and government entities. The Company has extensive experience reporting complex matters around the globe, including arbitrations, trials and depositions. Planet Depos is headquartered in Washington, DC with 60+ offices worldwide. A forward-thinking company, Planet Depos is conversant with the latest technologies and works closely with clients to implement case-winning tools, including streaming text and video, realtime to iPads, mobile videoconferencing, and digital deposition exhibits. Since 1973, Chicago-area Realtime & Court Reporting has supported the Northern Illinois legal community and beyond. Driven by a four-generation court reporting legacy, the company is grounded in a national referral network that delivers the best court reporters to your side—wherever. Few other companies can claim distinguished champion and medalist titles at national and state court reporting competitions. Known for their speed and accuracy, professional affiliations, and long-time presence, CaRR reporters are credentialed, invested, and involved. Chicago-area Realtime & Court Reporting has evolved with the industry—and technology—to deliver timely, accurate transcript turnaround. In size, the company claims its niche between large, multilayered organizations and home-based, freelance court reporters. A court reporter is responsible for recording spoken dialogue during a legal proceeding, including court hearings, depositions, arbitrations, and mediations. 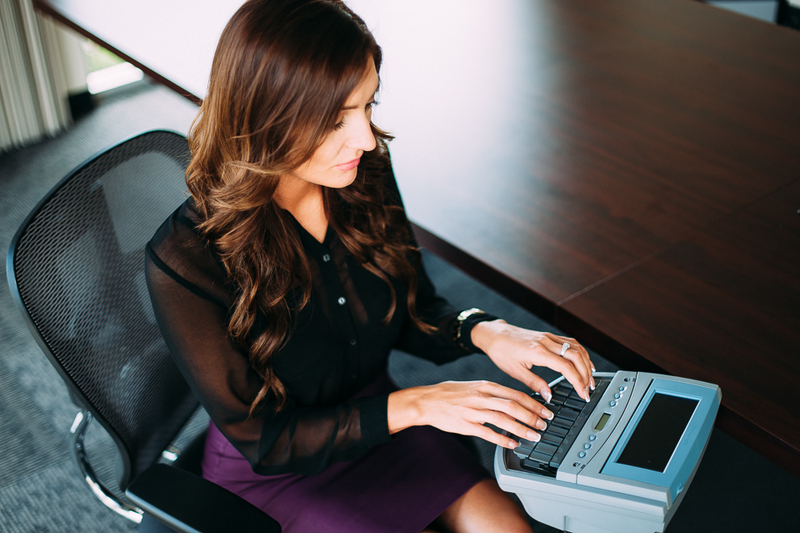 Court reporters are responsible for making an accurate, verbatim record to ensure that all testimony is preserved, making this profession vital to lawyers both in and out of the courtroom. Legal Stenographer – A stenographer uses a stenotype machine to transcribe spoken dialogue into a written form using shorthand, a method of abbreviated script. Realtime Court Reporter – A realtime court reporter allows attorneys to view testimony as it’s being spoken. A realtime reporter must be highly skilled and experienced in the field, as they produce readable transcripts for clients as the actual proceeding is taking place. Why Use a Court Reporter from Chicago Realtime?